Melrose Pk. Sac. Hrt. Sem. *Peoria Academy of O. L.
Maytown (population 25) is located in the north central area of Illinois in south central Lee County. 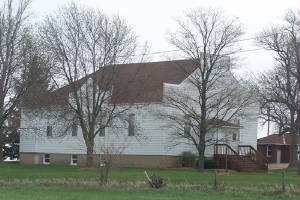 The hamlet sits in a true country setting about 10 miles west-northwest from Mendota (or 20 miles southeast of Dixon). Maytown Road is the main roadway to and from the area, as the town is situated between Morgan Road and Van Orin Road. There appears to be a populated subdivision about a mile or two northeast of Maytown as well. The actual hamlet of Maytown consists of a small former school building (now a storage facitlity, pictured below), a building which was possibly a school at one time (pictured above), and a beautiful brick church. There, three to four houses on Maytown road are near the location. The area was first settled in the 1830s. By 1843 the township of May had been established, and by 1845 land deeds were being sold. A post office was established and named May Hill. The town was named May after Captain May, an American officer who died in the battle of Palo Alto. By 1860 about 120 men lived in the township. A point of pride for the township of May was that of the 75th Infantry's Company "F" during the CIvil War, 47 of the men came from May Township. "The main building was 30x48. The L was 16x18 feet and the entire structure was 20 feet in height. The school was divided into several compartments. On the first floor were the school rooms, music room, parlor, sitting room, dining room and kitchen. On the second floor was the chapel, beautifully finished with a vaulted roof. The rest of the upper floor was divided into sleeping rooms, occupied by pupils who boarded at the academy. The building was surmounted by an observatory, from which a splendid view of the surrounding country was had. Young ladies alone were received as boarders, but boys wer received as day scholars. Six sisters of the Benedictine order taught the various grades in the common branches and in addition taught music, drawing, French and German." "The advantages to the township were immeasurable and May township as an educational center ranked very high. It seems to bad that so useful and institution should decline, but then in earthly affairs we must accept the inevitable. Like Lee Center, rivals attracted the children. As boys and girls read about the larger schools, like children the world over, they felt that the little school was not big enough for them and like the old Lee Center school it dropped out of existence peacefully and quietly, though leaving behind memories never to be effaced by the most vigorous workings of time. The teachers were of the very highest class. It does seem too bad that idealism cannot fight its way against the practical institutions of today." It is also duly noted that when the academy was abandoned in 1890 that St. Michael's Church was also left vacant. The academy was turned into living quarters for a Catholic priest on the first floor, while the second floor became an amusement hall. 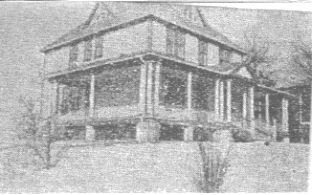 The building was later torn down after 1905, as was the church (in 1923).